Photograph courtesy Dave Smith. 25276 and its parcels train waits at Leicester, August 15th 1980. The train was headed for Nottingham, but with no relief crew available a conductor was found to assist the Nuneaton based crew to Nottingham. The twenty one year seven month career of D7626/25276/25903 covered three years at Eastern Region depots followed by the remainder at London Midland Region depots. Built: Beyer Peacock Ltd, Manchester (Works No. 8036). Time between last Classified repair and withdrawal: 73 months. Time between withdrawal and scrapping: 27 months. April 1966 to Wath (41C). August 1967 to Holbeck (55A) on loan and made permanent the same month. July 1968 to Manchester Division (D09). November 1968 to Birmingham Division. May 1970 to Preston Division (D10). May 1971 to London Division (D01). October 1971 to Nottingham Division (D16). April 1971 to London Division (D01). August 1972 to Nottingham Division (D16). October 1972 to Preston Division (D10). May 1973 to Springs Branch. Renumbered to TOPS April 1974. Renumbered to 25903 January 2nd 1986. After withdrawal 25903 was stored at Kingmoor, it moved briefly to Upperby for inspection on August 9th 1988. It revisited Upperby on November 10th 1988 and remained there until May 31st 1989 when it moved to Crewe, then Nuneaton (February 6th), Leicester Humberstone Road (June 3rd) and entering Vic Berry, Leicester on June 5th 1989. By the last week of June 1989 25903 had been scrapped. Photograph courtesy Jerry Glover. 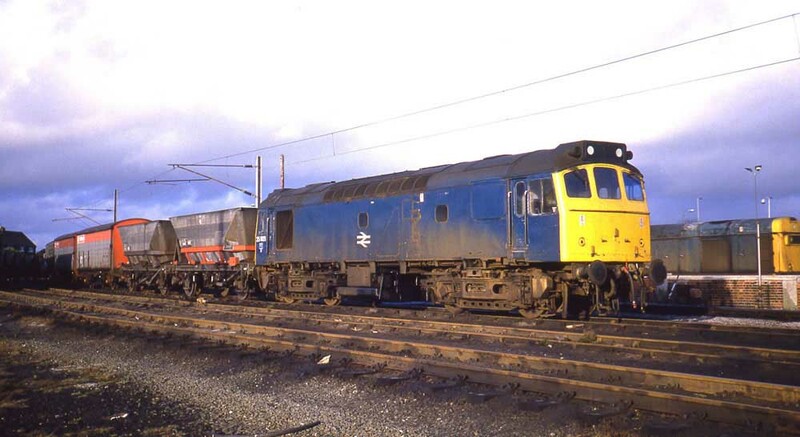 On May 31st 1989 25903 moved from Carlisle via Crewe, Nuneaton & Leicester, entering Vic Berry's yard on June 5th 1989. In this view from June 11th the locomotive is off its bogies and the engine has been removed. By the last week of June 1989 25903 was all gone. Noted Derby Works April 1966. Noted Derby Works September & October 1969. Noted Derby Works June & August 1974. 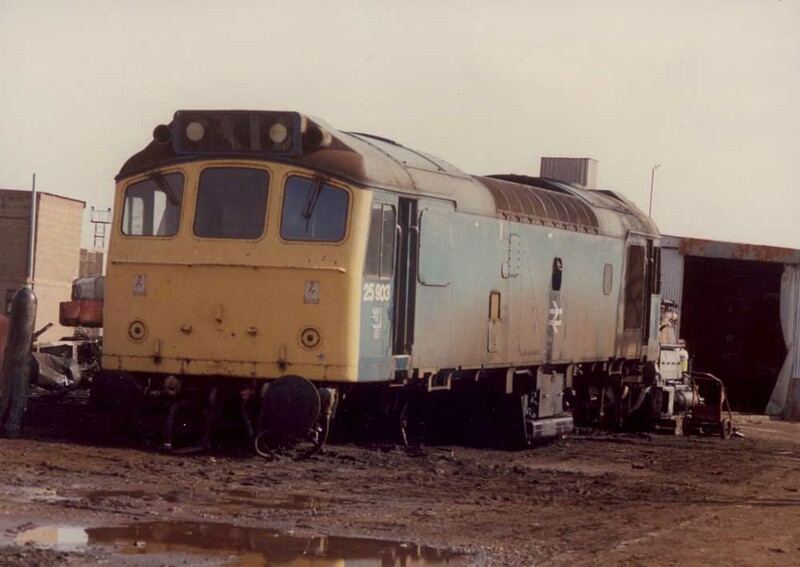 Noted Derby Works November 1979 - January 1981 (General Repair). The first recorded passenger workings for D7626/25276 involved the summer dated Sheffield - Llandudno Town roundtrip, being noted on July 1st & 8th 1967. On September 26th green liveried 7626 was noted at Heysham Harbour with the Up Ulster Express to Euston. On November 1st 7626 was noted at Exeter arriving with a train load of sugar beet from the Eastern Region (headcodes displayed 8Z15 west end, 8E53 east end). The locomotive was in two-tone green livery with yellow ends and 'D' prefix painted over and with the emblem on one side only. Three Coventry locals, targets 38,39 & 42 required dual braked locomotives, in this case Class 25s, since Bescot only had two at this time (7601 & 7626), this diagram was somewhat difficult to maintain! These matters were not helped by locomotives being borrowed from time to time. The continuing shortage of power on the Western Region allowed many strangers to reach deep into WR territory, the 18.00 Riverside – East Usk featured 25276 & 25089 on November 6th. During the early morning of November 13th wagons from a freight train derailed at Humber Road Junction, Coventry, blocking both lines with WCML trains rerouted via Nuneaton. 25276 was noted with a ballast working to assist with the track renewal. March 27th saw the Whitemoor – Royston tanks noted at Cambridge behind 25288 & 25276, most likely March were short of power that morning. 25276 & 25272 worked the roundtrip Walsall - Norwich (for Yarmouth) - Walsall diagram on June 11th. Three weeks later on July 3rd 25276 & 25116 worked the roundtrip 08.45 Birmingham New Street - Barmouth from/to Shrewsbury. It was a run down the NE/SW route on July 22nd for 25276 & 25282 working the 08.45 Birmingham New Street - Paignton throughout, the Class 25's would take the stock to Newton Abbot for servicing. A week later on July 29th 25276 & 25272 worked the 10.40 Euston - Aberystwyth from Wolverhampton, returning with the 16.10 Aberystwyth - Shrewsbury. A Manchester Piccadilly - Aberystwyth day excursion on August 20th was worked from Stafford (assumed) to Aberystwyth and back (out via Wolverhampton & back via Crewe) by 25276 & 25293. On the morning of October 28th 25276 was stabled at Cricklewood. On February 26th 87002 and five Royal Train vehicles with the Duke of Edinburgh ran from Euston to Berkswell. The train remained at Berkswell overnight in a siding with 25276 attached. The greater majority of the passenger workings for 1980 involved the Cambrian line to Aberystwyth. However the first passenger working for 1980 was a York - Birmingham International charter on June 27th with 25275. The next day (28th) the same pair were on the Walsall - Norwich (for Yarmouth) - Derby diagram although on the return working 25276 failed and was dragged. 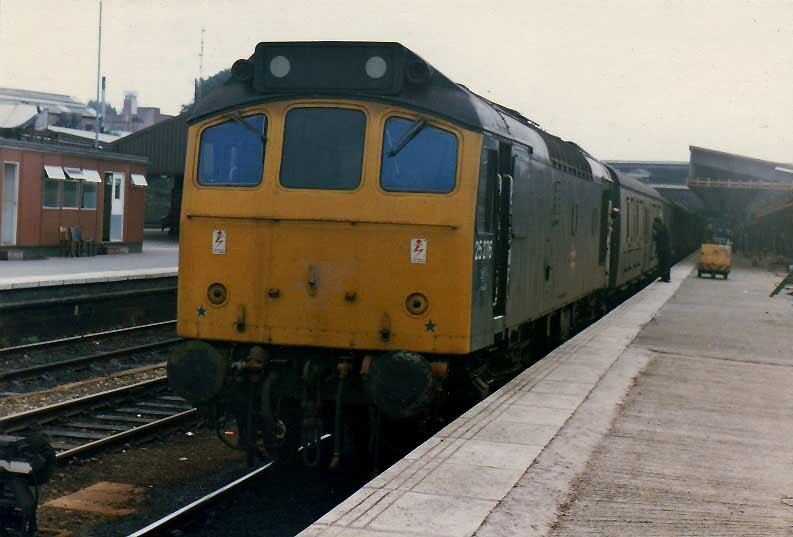 Then followed four workings on the Shrewsbury - Aberystwyth line, on July 26th with 25197, running about an hour late from Euston due to heavy rain, on the return working 25276 failed en-route and was removed at Shewsbury; August 2nd & 3rd with 25184 and August 9th with 25137. Photograph courtesy Dave Smith. Driver Ron and Guard Terry hang out of the cab window and cab door of 25276 at Brinklow Loop (Easenhall) as an express passes by, August 15th 1980. The 16.36 Birmingham New Street - Norwich on May 29th was worked to March by 25276. A return to the Cambrian line took place on July 7th with 25275 on the 07.40 Euston - Aberystwyth from Wolverhampton, returning with the 16.05 Aberystwyth - Wolverhampton. On August 15th 25276 was noted on the short Kensington Olympia - Willesden motorail workings. On March 17th 25276 worked an extra Tyseley - Parkeston empty Cartics train. 25276 worked the 08.57 Sheffield - Huddersfield (for Llandudno Town) on a miserably wet June 19th (portion of the 09.00 York - Llandudno Town), and worked the return 17.10 Huddersfield - Sheffield, parked in Huddersfield goods yard inbetween workings. The 16.05 Leeds - Carlisle was worked on August 9th whilst on September 20th 25276 handled the 19.15 Blackpool North - Manchester Victoria. When 27033 failed at Annan on November 2nd with the 13.45 Glasgow Central - Carlisle, 25276 took the train forward to Carlisle. Assistance was provided by 25276 to the 11.55 Euston - Manchester Piccadilly between Hanslope Junction & Rugby on March 23rd when the power was off because of overhead line damage. Another run was made to March, working the 10.15 Birmingham New Street - Norwich on May 4th 1983, with 31263 taking over at March. The next day (5th) saw the local trip working from Whitemoor handled by 25276. Railtour duty took place on June 26th with 25276 & 25199 working the roundtrip Llandudno Junction - Blaenau Ffestiniog portion of the 'Ffestiniog Pullman' railtour. On July 9th 25276 & 25306 worked the 10.10 Euston - Shrewsbury from Birmingham New Street. Two Cambrian line roundtrips followed, on August 13th with 25284 and on August 20th with 25259. 81011 failed with a broken pan in the Ledburn neutral just south of Leighton with a Euston - Birmingham West Ham football special on January 14th. The resultant wires down caused much chaos with 25276 about to assist 81011 and train to Bletchley. January 14th saw 25276 assisting the 10.15 Manchester Piccadilly - Euston between Bletchley & Hemel Hempstead because of the power being off due to overhead line damage. On the Crewe – Cardiff line the failure of 25276 on January 25th on the 15.02 Manchester – Bristol parcels near Leominster causing heavy delays to services, rescue arriving with 47056 off a Margam bound coal train. On April 1st 47403 failed before departure on the 12.45 Blackpool North - Manchester Victoria, 25276 assisted throughout. A charter train on May 6th was worked roundtrip by 25276 & 25283 between Wolverhampton (out)/Shrewsbury (back) and Aberystwyth. The Cambrian line was revisited on August 25th with 25298 on the 10.10 Euston - Aberystwyth from Wolverhampton, returning with the 17.05 Aberystwyth - Shrewsbury. The 18.15 Birmingham New Street - Norwich failed behind 31420 at Nuneaton Abbey Junction on October 4th, 25276 took the train on to Peterborough. On October 16th 25276 worked the 21.44 Preston - Liverpool (off the 18.20 Glasgow - Manchester). January 2nd found 25276 at Manchester Victoria on banking duty. On a snowy January 7th 25276 was noted eastbound through Wakefield with empty bolsters. February 4th noted towing a failed HST through Chesterfield, later seen at Derby with just the two power cars. Visitors to Severn Tunnel Junction included 25276 on March 6th leaving with the Mossend vans including a dead 47606. 25276 was north of the border on April 3rd working the relief 13.50 Birmingham New Street - Edinburgh forward from Carstairs with 25300. May 4th saw 25324 & 25276 southbound over the Settle & Carlisle with a parcels train. On May 18th 25276 & 25051 worked the 13.40 Aberystwyth - Wolverhampton forward from Shrewsbury, being extended due to late running. When 33047 failed at Shrewsbury on July 31st with the 12.00 Cardiff - Crewe, 25276 dragged the train to Crewe. 25276 was again north of the border on September 9th with the 12.40 Carlisle - Glasgow Central. 25200 and 25276 paired up to take the Severn Tunnel to Mossend Speedlink on July 24th 1985. December 15th found 25276 at Crewe on local duties in the pouring rain, whilst Christmas Day 1985 found 25276 stabled at Warrington Arpley. Attempts to move 25276 to Carlisle for a 'C' exam were not completed until after the New Year, New Year's day was spent at Skipton, with Carlisle reached on January 2nd, renumbering to 25903 taking place the same day. A visit to Llandudno Junction on December 6th found 31176 present for driver training, with three of the ‘old guard’ present, 25191, 25213 & 25903. 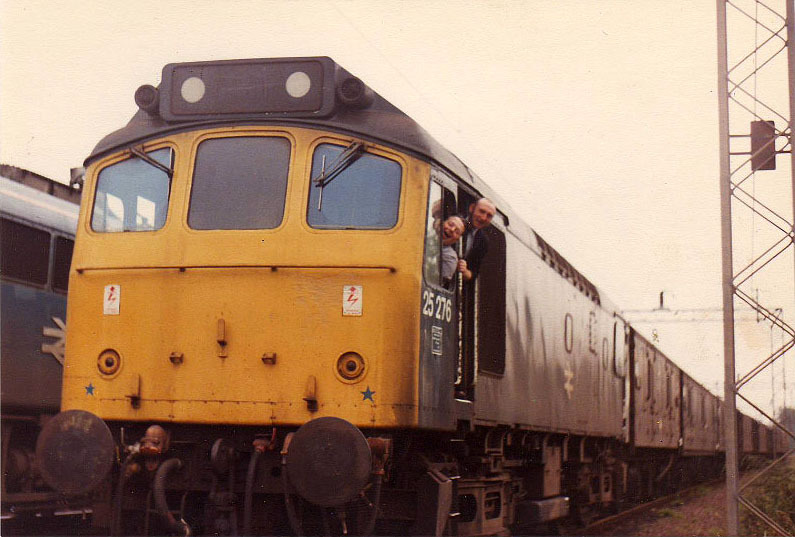 Pre-Christmas travellers on December 23rd needed assistance from 25903 when the 20.30 Inverness - Euston failed at Thrimby Grange behind a Class 81, the train was pushed the two miles to Harrisons Sidings. February 8th - 25903 noted arriving at Springs Branch with an electrification train from the north. March 5th - noted at Warrington Bank Quay. March, Eleven of the class would now operate after the official withdrawal date. Wednesday added six victims, 25191/265/279/313/903/910. During the weekend 25903/904 had been coupled together, however by Monday 25903 was alone handling 1P20 02.30 Crewe - Barrow in Furness, from Preston, with one parcels van. Following this working it ran to Kingmoor. Of the last 27 Class 25s overhauled only four would be in service at the end, six years later: 25057/265/276 (as 25903) and 25278. The final recorded passenger working for 25903 took place on February 9th when 45139 working the 13.53 Scarborough - Liverpool required assistance from near Parkside Junction to Liverpool. Photograph courtesy Tom Sutch. The afternoon sun catches 25903 at Springs Branch on February 10th 1987. This locomotive would last until the end of regular Class 25 working, despite a period at the end of January when it suffered time out of service with low power problems. At lunchtime on March 12th 25903 was at Ellesmere Port, with 25904, these two remained together at least until March 16th when 25903 alone handled the 02.30 Crewe - Barrow vans forward from Preston, with a load of one van. Following this 25903 made its way to Kingmoor for eventual withdrawal. 25903 was withdrawn on March 18th 1987. Not all known passenger workings are recorded on this page. Page added July 1st 2013. Last updated March 29th 2019.